Each year Vishay releases thousands of new components that enable our customers to create new and superior end products. We recognize that offering unique component solutions helps improve the performance of next-generation devices, overcome technical barriers, and create new markets. 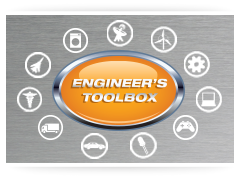 Inside the Engineer’s Toolbox we have highlighted some of the innovative components Vishay manufactures that help design engineers develop superior end products. Using six major market segments (Alternative Energy, Automotive, Industrial/Power, Lighting, Medical, and Military/Aerospace), we have highlighted 12 Vishay components for each segment with the qualities most suited for them. For each component we list key features, potential application ideas, and relevant datasheets and support materials. For product inquiries, please contact your local sales representative.